Three-time Indianapolis 500 winner Johnny Rutherford maintains a well-deserved reputation as a personable, articulate and cultivated ambassador for auto racing. Similarly, his Indianapolis 500 wins came in sophisticated, innovative, cutting-edge vehicles. 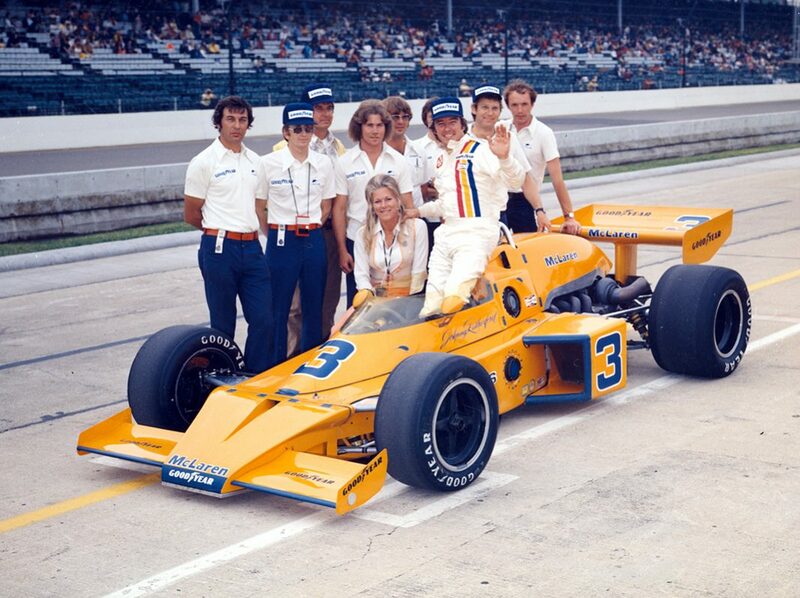 He won his first 500 in 1974 as part of Team McLaren’s technological onslaught on American open-wheel racing. He repeated with the team in 1976. In 1980, Rutherford wheeled Jim Hall’s trendsetting “Yellow Submarine” to a dominant month of May. He won the pole and led 118 of the 200 laps to win his third 500. Belying that personal and technical sophistication, Rutherford laid his racing foundation on the dangerous, rough-and-tumble short tracks unique to American racing. He clawed his way to the top at treacherous speedways such as Devils Bowl, Eldora, Winchester and Salem. 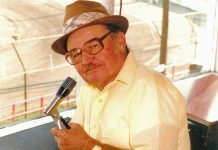 He loved those reckless races on the dust bowls of the IMCA and the spellbinding speeds on the paved high banks as he tussled with racing giants in breathtaking USAC features. He reveled in the camaraderie with his competitors as they banged across the country in old station wagons and pickups, eating bologna and white bread sandwiches and bathing in lakes and streams. He fondly recalls days of hard racing in front of rickety grandstands packed with awe-struck, cheering fans, then sharing their fried chicken and beer as they rehashed the day’s excitement afterward. By1966 those fairgrounds half-miles and fearsome “Hills” had pushed Rutherford toward the upper echelons. He’d already made three Indianapolis 500 appearances and claimed the 1965 USAC national sprint car championship. Then Ohio’s Eldora Speedway nearly snuffed out his life. Eldora was a favorite of Rutherford’s. His first USAC victory came there in 1964 and while vying for the 1965 title he set a track record on the half-mile clay oval. For the spring 1966 race, intrepid Eldora owner/promoter Earl Baltes proclaimed it Johnny Ruther­­ford Day. Driving for Wally Meskowski, Rutherford struggled to work out the new-car bugs. 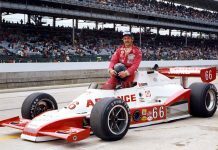 He made the feature through a heat race and while attempting to pass teammate Mario Andretti a rock torn loose by Andretti’s tires, pounded Rutherford between his eyes, knocking him unconscious. The out-of-control car bounded into the guardrail and flipped 25 feet into the air, tumbling over a 60-foot embankment into a creek. 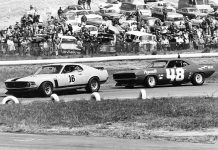 When the car slammed to a stop, Rutherford’s flailing arms impacted the windshield, breaking both. He spent a month in the hospital and endured a year of arduous recovery that included seven surgeries, multiple bone grafts and several bouts with infection. Demanding as that was, Rutherford never thought of quitting. He’d fallen in love with the sport when his dad took him to the races as a kid, and he had no intention of letting go of his passion.